This week I received a gift as wonderful as my newly mulched garden beds (yay! don’t have to spend Mother’s Day weeding and hauling mulch). Author and blogger Deborah Lawrenson presented me with the Beautiful Blogger award. If you want to know beautiful, visit her website Provence, the Luberon, and an old house on a hill. It’s filled with photos of the landscape that inspired her latest novel, The Lantern. It’s a gothic tale of love and murder. You don’t have to worry about any spoiler alerts in my post today, though, because it’s one of four or five books I’m reading right now so I can’t let slip the ending. 3. 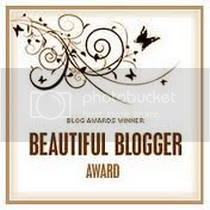 Nominate 7 fellow bloggers for the Beautiful Blogger award. 4. Inform the bloggers of their nomination. 5. Include the award images in your blog post. 1. I’m heading off to the River Teeth writing conference next week. This is not the kind where my writing and I can hide in a corner. Excited and scared. 2. I’ve studied deeply in a lot of things now useless in my current incarnation – Latin, Greek, ancient rhetoric, linguistics, Reformation history. 3. 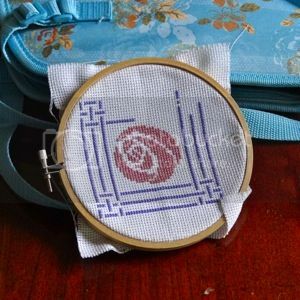 I’ve been trying to finish a single cross stitch project for over a year. I bought it in the Scottish Highlands in 2005. Due to inattention, I’m always miscounting and have to rip stitches out and start the row again. 4. I’m addicted to buying wooden chairs at estate sales. None have ever cost me more than $15, but most remain in the garage waiting for their time to shine in the house. I’m not as obsessed, however, as my husband’s uncle. 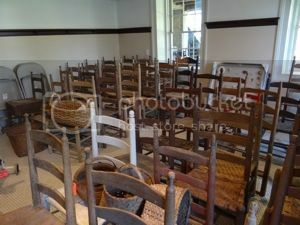 He bought 200 historic Georgia chairs at an auction and now has the basement of his antebellum house filled with them. 5. The first two weeks of my time in France this summer will be sans my husband and his French fluency, which has uncomplicated complicated situations more than once in the past. I guess if I stay in the apartment and write write write like I’m supposed to, then nothing can go wrong. Mais oui? 7. I love all of those geneology shows on television now, but I haven’t the slightest idea where my family (either side) originated beyond St. Louis. Right up front I’ll acknowledge that I’m slacking in my esteemed duties. Tonight my husband and I are hosting his department in a barbecue so I have beaucoup des préparations. This means I’ll be cutting my nominations off at five. That means for you, my readers, that you’ll have more time to spend enjoying these wonderful blogs. Nichole Reber teaches us so much about, well, ArchitectureTravelWriter. She covers these three currently from her expatriot home in Peru. She is also a cheerleader and encouraging coach over on SheWrites. You can find her extensive freelance work here. Dona Bumgarner’s blog Aubergine: musings of a midlife mama is a recent find for me. Her philosophy: “To pay attention, this is our endless and proper work” (Mary Oliver). 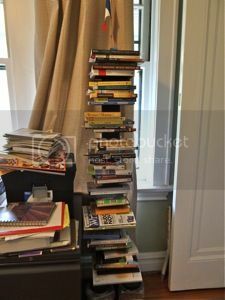 She gives her readers books, food, parenting, photographs and more. I guarantee you’ll find something you like. Jennifer Walker entices you with My Morning Chocolate. Its tagline pretty much says it all: “Delicious Inspiration for People Who Wake Up Thinking About Food.” Visit it the recipes and philosophies on food but stay for the photographs. You can see more of her freelance work here. Tami Clayton is a YA author who is Taking Tea in the Casbah. Right now she’s telling us all about Morocco, Spain, and Germany. When she’s not giving us traveling tales she’s talking about books/writing and giving us an ringside seat to her ongoing correspondence with Benedict Cumberbatch. Finally, I’m sending recognition to the group blog Blooming Late Writers. I joined this group over on SheWrites and don’t give it as much attention as it deserves because my time is spread thin. However, these are a group of women who didn’t find their writing mojo until after 40 years of age. They remind me to keep writing even when I give excuses that stack up to my neck. Many have found success, letting us all know it’s never too late to chase a dream. Bonne weekend, my friends! Please visit these wonderful writers and leave them some gushing comments. Then come back here and tell me in the comments box what your plans are for the weekend. You most certainly are a busy woman-- collecting chairs, reading half a dozen books simultaneously, participating often on SheWrites, plus blogging. I've checked out your blog a few times over the past months; there's always something beautiful about it. Plus, I adore your sense of humor (e.g., the swimsuit competition comment). The SheWrites global/travel writers chat takes place at 330 EST Tuesday. Do you have another appointment that day or will you be joining us and showing off your recent news? After next week I'll be changing the time/day, which should boost the attendance. Though it won't take place until June. Congrats Julie, and Thank You as a feelow member of shewrites, I appreciate your accolades. They are aspecial bunch of ladies. I've been slacking on keeping up with our Shewrites/Blooming Late, bloggers for the awesome reason of productive writing days. Gorgeous Iris! One of my favorite garden flowers. I just might make it this time, Nichole. 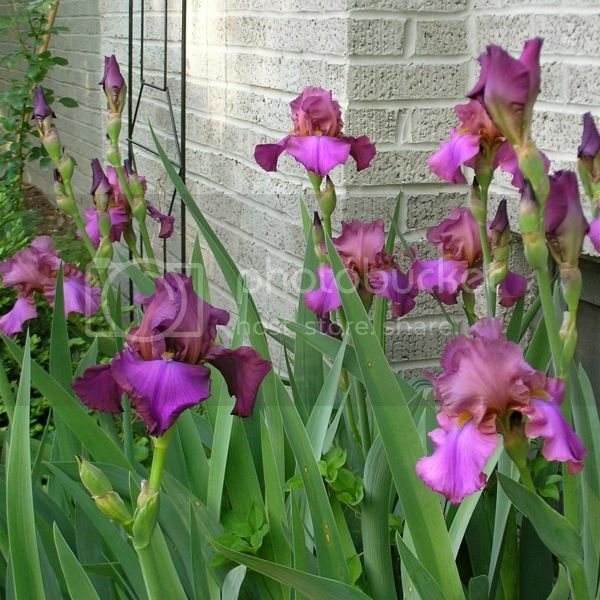 And Lynne, thanks for the compliment on the irises. They're from my mother's garden. When my dad sold that house I dug some up and carried them from house to house, always leaving some behind and taking some. They are from iris stock that is over 50 years old. Thank You SO much Julie for saying that about the group! You are a real part of the hub of that group and I wouldnt know what to do without your happy face and wonderful wit in there! And chair collecting is a new one Ive heard of, I started collecting blankets when I was pregnant with Bry,instead of food cravings thats what I got! lol Theyve come in handy over the years though! Im sure your chairs will too! River Teeth will be a richer, more delightful group for having you and your writing there, Julie! I'm so glad that you're going, and look forward to hearing all about it. Julie, I'm a bit late, but thank you so much for the Beautiful Blogger award nomination! I love the idea of sharing 7 things that your readers don't know about you. It's always fun to learn more about the writer behind the blog. Beautiful picture as well! Very pretty blog and good humor too. Thanks for recognizing all the bloggers on SheWrites.